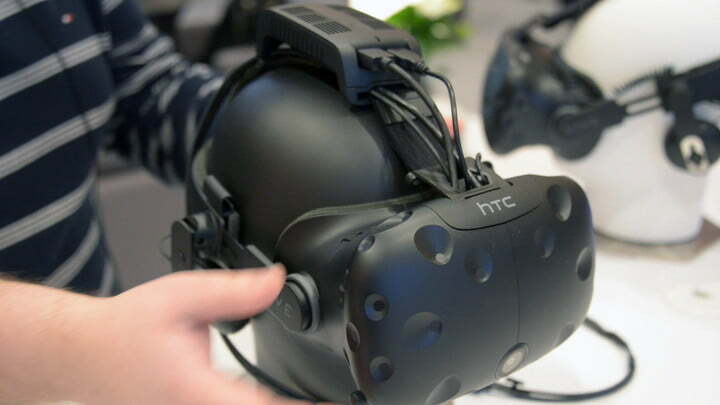 Rather than launching a new version of the Vive, HTC will launch a set of official and licensed peripherals in 2017 to enhance the platform, the company announced at CES 2017. The most anticipated of these — if only because it was shown last year — is the TPCast wireless adapter, which lets you use the headset without worrying about the long trail of wires between the headset and your PC. The Vive’s best feature, the room-scale sensors that track your movements in real space, are hampered by its wires. Its easy to trip over them while walking around in a game, and disconcerting to strain against them if they grow taut. Removing those wires, in theory, would complete the room-scale experience, at least in its current form. As a proof of concept, the TPCast adapter makes it clear that wireless consumer-grade VR, even with the fidelity of the Vive, is within reach, if not inevitable. The TPCast adapter looks a little strange. A small, but not inconsequential black box slides onto the top of the Vive head strap, and plugs into the headset’s USB and HDMI cords. Though it looks like it should be heavy, the adapter does not weigh heavily on your head, at least in short bursts. It performs exactly as it’s supposed to. In a shooting-gallery-style demo for an upcoming Vive Tracker-based peripheral, the PP Gun assault rifle, there was no noticeable latency between our movements in and out of game. We could whip our rifle around, move around the Vive room at any speed, and the TPCast seemed to keep up. 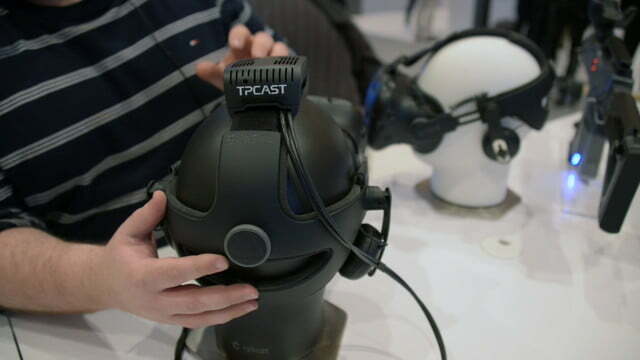 According to TPCast, the adapter will add less than two milliseconds of latency, and while we can’t confirm that, the wireless connection does not seem to impede your ability to use the Vive so long as the connection stays in tact. That’s where things go off the rails. While the TPCast works very well under ideal circumstances, it seems to be an incredibly delicate device. One wrong move and the connection can cut out, at least momentarily, if the adapter is touched or jostled. The game did not break or miss a beat, so when the connection came back we could return to playing, but the experience was jarring. 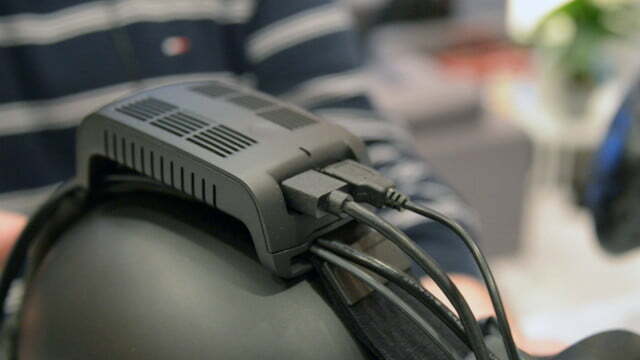 TPCast said such connection blips would be less frequent in the final version. We also experienced other connection issues — the PP Gun in the demo would not always reload or fire. However, it wasn’t clear whether this was an issue with the controller, the software, or the adapter. Then there’s the issue of the adapter’s battery. The wireless adapter connects to large battery pack, which has to be stored in a pocket on your person. Stored in the back pocket of our jeans, the XL battery, which gets up to five hours of battery life, heated to an uncomfortable temperature very quickly. When it was announced, we bemoaned the fact that the standard TPCast adapter would only allow for up to 90 minutes of gameplay. After using it, it seems unlikely that you would want to use it for more than 15 minutes. The final version of the standard battery may not get quite so hot, mind you, but there’s a real chance that the adapter may be very uncomfortable to wear. The standard version of the TPCast wireless adapter will cost $250 when it launches in “Q2” 2017. The expanded version will launch at a later date. 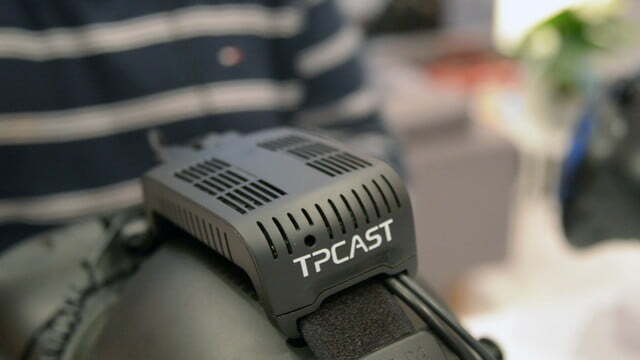 If TPCast can work out the kinks, the adapter could be a must-own accessory. 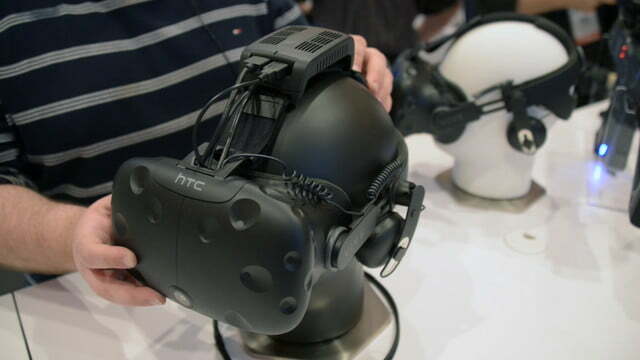 If not, at least we know there’s a future out there wireless VR.